Amazon Rental: Are e-books and rental actually cheaper? “The colleges in 15 states and one Canadian province that make up the Community College Consortium for Open Educational Resources (CCCOER) will now be able to tap into the collection of open textbook resources compiled by the international group of institutions that make up the OpenCourseWare Consortium (OCW Consortium) and vice versa in a new partnership. The community college consortium, which represents 200 schools, has become an associate consortia member of OCW Consortium, and its advisory board will effectively act as a voice for the two-year colleges within the global consortium’s organization . .
Campus Technology: Is the iPad Ready To Replace the Printed Textbook? Since I’ve been posting so much about the heavy industry-side, here’s a little break for student readers. These jobs are the most convenient and can make the most money while taking up the least time! An on campus position is the most ideal part-time job for a student. It’s convenient in proximity, and the stores tend to be more lenient when it comes to scheduling and letting you do homework or study on the job (always a plus around finals). On-campus jobs tend to have little perks, too. It’s different for each book store, but at the University of Washington Bookstore, for example, there is a program that subsidizes your bus pass (which in a city like Seattle definitely comes in handy), and the pay is awesome (nine to nine fifty an hour). At the University of Arizona Book Store, they have a “loan a textbook” program, which essentially gives the working student free books for their semester. On top of all the extra benefits, you get valuable “real world” experience. Bartending and serving aren’t necessarily the easiest of jobs, not to mention the fact that they aren’t always “part-time,” exactly. But Infobarrel has a good rundown of three reasons to work as a bartender and/or server: friends/social interaction, convenience, and last, but definitely not least, money. While serving, especially at a bar, chances are you won’t completely miss out on the fun because your friends will socialize where you work. Restaurants and bars, depending on the type, are typically generous to second hand priorities. Most people who work in the food industry have other obligations—so the schedule is pretty relaxed. If you work at a bar your shifts will typically be at night—so you’ll never have to miss a class! People are usually pretty generous when it comes to switching shifts as well; everyone is just trying to make some money! Lastly, servers and bartenders might not make the best hourly wages—but what they lack in salary they make up for in tips. A server/bartender can walk away from a nights work from anywhere in between $80-500 depending on how sophisticated their place of work is. If you work three times a week that’s at least $240 in extra spending money! One thing Infobarrel didn’t mention was the experience required to serve or bartend. Any profession one goes into afterwards can be benefitted from a solid training in people skills, patience, multi-tasking and hard work–all of the things tested as a server. Free room and board? Having your own room? And living in the perfect location? What’s better than that? Nothing! That’s why being a resident advisor (RA) is so great while in college. You save money, and there’s nothing better than free food. The benefits are outrageous—not to mention the amazing experience and leadership skills you’ll gain. It’s a well-rounded job for any college student. We can’t condone any illegal action—you should always consult with your employers—but most of the time nannying or babysitting, especially if done sparingly, can slide by tax-free. Don’t know anyone with kids? With plenty of websites to help the nanny/babysitter find work, finding a position is never hard. Companies like nannies4hire, sitter city, care4hire, also give background checks so you know that you are being put in good hands! While the good money is probably the biggest perk, some would say getting the chance to be a kid again is up there too! For those overachievers who already know what they want to do, (just kidding!) an internship is the perfect opportunity. It not only gives you the experience you need for your professional life, but it’s a great resume builder. If it’s not paid, or giving you a stipend, then it’s accepted as college credit. Either way you are killing two birds with one stone. It’s a great way to interact with people in your field of interest, and gain the knowledge you need to be successful once you reach your big graduation day! As we study the move to digital reading, we are introduced to new players such as the Worldwide Center of Mathematics, Flat World Knowledge, and others such as Inkling, Kno, and increasingly more. But the more-traditional players, the established textbook publishers, are not far behind and they have their hands in the game as well. Remember, they own the content and while new players like FWK will get some adoptions, the publishers will not give up market share without a fight. Kind of like a hedge bet in Vegas when you place your bet to cover your other bets, the publishers are spreading their risk by taking ownership of the industry via different platforms. McGraw-Hill and Pearson own stakes in Inkling while all six major publishers have stakes in CourseSmart. I think we would be naïve not to believe that if one platform were to really take off (this has yet to happen where there is a de facto standard), the publishers would be wise to invest in or own it. In addition, a successful platform is only as good as the content it delivers. Academic publishers are working with different platforms to control the price, market share, and content. It will be hard for start-ups to take away significant adoptions from traditional print publishers unless they can prove to faculty and administrations that the books desired by the educational community are available on the platforms or learning systems that educators desire. 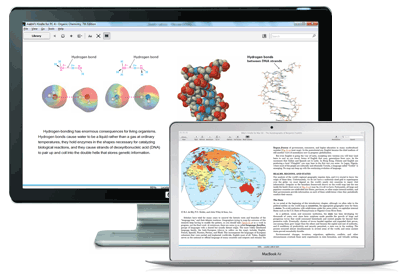 Why do publishers really love the eBook/eTextbook? Because it is the first real used-book killer they have found. The publishers have tried for years to shrink the used-book market as it drastically diminishes their sales. They started off by marking teachers’ editions and desk copies, even drilling holes and other tactics to make these books unsellable. Then they began frequently changing the editions, adding components to create packages and bundles, and updating the book (however slightly) to make last year’s copy seem obsolete. With changes requiring publishers to unbundle books and to make ISBNs and prices more upfront, publishers now need to find a new way to keep the used-book business from hurting their overall profit. Enter the digital platform.